Hardbattle Books is no ordinary bookshop. Magic has settled there in every corner and over the years has brought chaos to Mr Hardbattle's life and driven away most of his customers. His livelihood threatened, Mr Hardbattle is finally forced to take action. Together, Mr Hardbattle, the resourceful and down-to-earth Arthur and Miss Quint embark upon a quest to find a new home for the magic. Start reading Magical Mischief on your Kindle in under a minute. This is Anna Dale's fourth book for Bloomsbury. Whispering to Witches, her first book, sold in twenty-five languages. Anna Dale lives in Southampton. Mr Hardbattle runs a bookshop but it is a bookshop in which magic has taken up residence. There are strange and noxious smells, drawing pins attack people they don't like and rubber bands having competitions pinging themselves across the room. All these strange goings on have driven the customers away and Mr Hardbattle is in danger of having to close his business. Then Arthur and Miss Quint turn up and try to help. What follows is an interesting and amusing series of events involving a velour elephant named Trunk who is waiting forlornly for his owner to return and an increasing number of strange characters who might or might not be real - not to speak of the second step from the bottom which turns to custard from time to time. Is it a children's book or is it one for adults? Who knows? Does it matter anyway? I found it interesting reading with a real feel good factor. It is easy to suspend disbelief for the length of the story. This is the sort of book to read on a cold winter afternoon as it will restore your faith in human nature and give you a nice warm feeling. Books are a magical experience, so it is not a surprise to find a tale where magic and a bookshop go hand in hand for the young reader. An offering where magic, mayhem and fun should ensue. That said, with this titles blurb, I really expected a Mr Benn type of adventure and was sadly disappointed as it would have been not only exciting to have had the principle characters chasing villains bent on ruining literature classics throughout their titles in the hope of stopping a greater catastrophe to the world of literature. Sadly, this was not the case and whilst the tale did fulfil the blurb and there were moments of pure indulgence, I felt a little cheated at the possibilities left unrealised. Other than that, the dialogue had a realistic bent to it, the characters did stay true to their conception and there were touches of magic such as having characters grow to reach greater potential than they envisioned. All in, it did do what it set out to do, the characters were acceptable and to be honest I really fell for Trunk (who I think was a homage to Bagpuss), now all I need to do is find a shop where I can get my own magical toy elephant. I found this to be both a charming and witty tale of magic and friendship. It wasn't at all what I expected from either the cover or the blurb on the back, but it surpassed my expectations regardless of this. At first, I had no idea how this seemingly simple story line was going to take up so many pages! But when Susan - by far the best character, with her journey seeing her grow from being an extra into a leading heroine - and all the other 'book characters' arrived, I knew I was in for a treat. 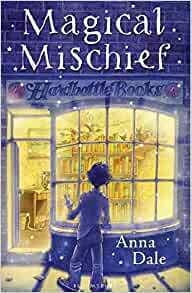 I very much enjoyed the humorous tone that Anna Dale injected into the story and look forward to reading more of her books.